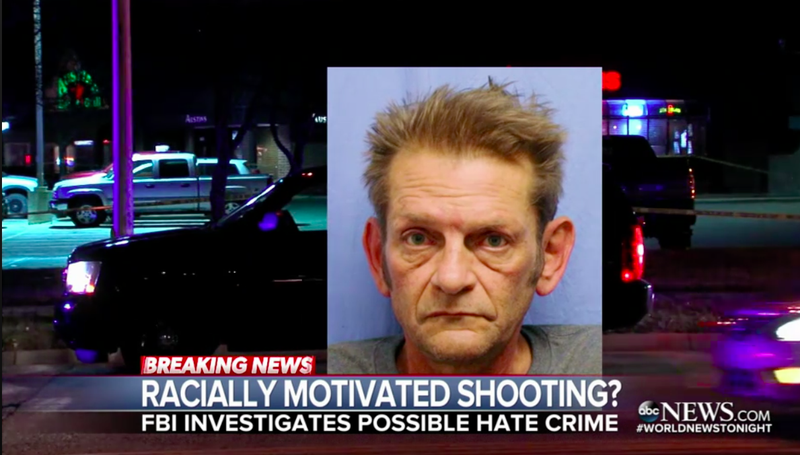 The Wednesday night shooting of three men in a Kansas City sports bar is now being investigated as a possible hate crime after witnesses say the shooter yelled “get out of my country” before opening fire on two Indian men. The Kansas-City Star reports that Adam W. Purinton allegedly shot three men in the incident —Srinivas Kuchibhotla, 32; Alok Madasani, 32, and Ian Grillot, 24, who was shot after trying to intervene. Kuchibhotla died Wednesday evening. Witnesses report that they heard Purinton yell “Get out of my country” before shooting Kuchibhotla and Madsani. After fleeing the scene, Purinton made his way to an Applebees in the town of Clinton, reportedly telling the bartender there that he “needed a place to hide out because he had just killed two Middle Eastern men.” Neither Madsani or Kuchibhotla are of Middle Eastern descent; they worked as engineers at Garmin and are believed to be from India, the Verge reports. Grillot said that the bullet went through his hand and into his chest, just missing a major artery. A GoFundMe page has been set up for Kuchibhotla to cover funeral costs and grief and recovery support for his family, exceeding its goal of $150,000 in just nine hours. Purinton is being held on a $2 million bond.